Being a cross of the old Vectrex forums (R. I. P.) and a vector gaming forum on Yahoo! Groups (also long dead! ), the vector gaming forums takes things a few steps further by also having discussions on raster vector ports and even current vector-like online and portable device/cell phone games. There are also forums for any kind of game console, from the oldest Pong machines to the most current gaming rigs available such as the XBox 360, but the main focus are on the beloved wire-frame games. And even though people who join can have whatever avatar they want (just as long as it abides by Proboardsí TOS), there are currently a little over two dozen vector icons on the site to choose from as they wish, covering coin-op, Vectrex, raster ported, and even some current online vector-like games. Have a look and sign in at vectorgaming.proboards.com, hosted by Darryl B. This project that started around two years ago has finally come to fruition. I am happy to say that I am now selling reproduction overlays. Graphically reproduced by Peteski and brought to you by VectrexMad! With normal postage I will not be responsible for loss or non arrival of package. I highly recommend recorded signed for postage method for countries other than the UK. I've added a screenshot to the webpage, and will also add a sampling of the Tripod animation in a couple of weeks. I've spent many hours meticulously re-creating the animation based on the Cinematronics original. 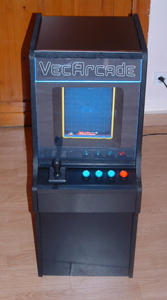 I made a few minor graphical changes to better suit the Vectrex. This has taken a lot longer than anticipated, and so I must change the release to late April. My apologies, but the game will be worth the wait! All pre-ordered Zantis games (1st and 2nd editions) have shipped. If you haven't picked up Zantis, now is the time! The Vectorbeam classic! Announced for an August release! Updated game play includes the original 2-player game + an all new single-player campaign mode with multiple enemies! Battle the dreaded Warhorse! Annihilate the Warlok and all of his mystical powers! 7 warriors in all! Warrior will be the first Fury game to include an overlay, and will also come in an original Vectrex-style box. The game will not be released in a stripped down version for a lower price and that decision is solely based on the fact that the overlay defines the game play area in this game. It's a part of the visuals, and not merely an enhancement. I can't think of another Vectrex game where that's true (correct me if I'm wrong). I won't hesitate to admit that the price is heftier than my usual game prices, but that should be expected as the overlays/boxes are being professionally manufactured. The additional amount that I'm charging ($30) will barely cover the additional costs. I have already gone over this with the printing company that I'm using. It all boils down to thousands of dollars that I will be fronting for this project. I recommend getting your pre-order in as soon as you can. This is a limited run of 100 games. No guarantees on a second run, which would require at least an additional 50 (over the initial 100) pre-orders for me to commit to it due to the minimum overlay purchase required by my printer. Pre-ordering is open! $65 + s/h ($7.50 US/CAN - $15 ALL OTHERS). Slightly higher shipping to accommodate the larger box/packaging. As always, insurance is extra. Please allow up to 24 hours for order confirmation (includes serial #). The games will be numbered in the program, and also on the boxes this time. Like War of the Worlds, Warrior is another game that simply needed a Vectrex release and I'm happy to be the one to do it! This will be my final Vectrex game release for 2011. Exactly five years ago today, I announced my first Vectrex game: Debris. The game sold out quickly after its announcement and while I received much positive feedback on it, there were features that I wanted to include but couldn't at the time. Due to the large amount of graphic and music data, Debris took up almost every byte of the 32K available. Now to celebrate its fifth anniversary, I am happy to announce Debris Revisited. Ideas I wanted to include in the original and feedback given by players have been mixed with additional features to create a new version of Debris that will hopefully please all. Revival Studios has announced 2 new vectrex games! Revival Studios has announced 2 new vectrex game releases, to be launched at the Retro spelcomputer event held in Apeldoorn/The Netherlands on October 3rd 2010. Pre-orders for Sectis will be accepted through March 30th, 2010. The total number of pre-orders received will constitute the entire run of Sectis. There may or may not be a subsequent run of Sectis games, to be decided later. Only pre-ordered games will come in translucent cartridge shells with matching clear cartridge labels! After the pre-ordering period ends, any subsequent run of Sectis will come in black cartridge shells. The cabin is build completely from wood, later colored in black and some original game designs are added - you can choose between red Scramble or blue MineStorm design. All parts are made by hand, Rudy uses the Donkey Kong cabinet in half size with the exact measure for the side and adapted the width for put a Vectrex in it. There will be a limited production of only 5 VecArcade "Series One" Construction Kits, in collaboration with VectrexMuseum who owns the #1 model. A Sticker including the production number, the production date and the name of the first owner will be attached to the VecArcade. You find more informations and the order list here! The VectrexMad! Productions AutoFire dongle gives you super human shooting powers. "Fire"/shooting finger hurting or need some help to get to a higher level in a game? Then the AutoFire dongle could be just what you are looking for. With the AutoFire dongle holding down the fire button shooting is continuous. See a YouTube Video of the Dongle in action. 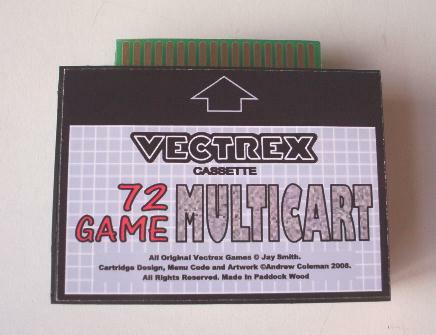 Andrew's versions of the 72 in 1 Vectrex Multicart are now back in stock.